Scott Cooper has thus far made a career out of producing films which are by no means awful, but they are certainly fairly unremarkable. His debut film Crazy Heart nabbed Jeff Bridges an Oscar and is a very conventional film which is undoubtedly elevated by his performance. His second film Out of the Furnace was a dreary look at Mid-Atlantic America, once again elevated by its lead actor Christian Bale. Black Mass proved to be a bland gangster flick with a Johnny Depp performance that ran away with the film to both positive and negative effect. Cooper’s latest sees him re-team with Bale, but once again he has produced a film which operates within the conventions of its genre without offering much in the way of surprises or originality. The year is 1892. The Frontier days are nearing an end, with the American troops taking command of most of mainland America. Bale plays Captain Joseph J. Blocker, a man notorious for rounding up Apaches by aggressive means. He is tasked with escorting a dying Cheyenne war chief (Wes Studi) to his place of birth in Montana so that he may die peacefully and be laid to rest in his tribal lands. Reluctantly, he agrees to the task, heading out on a journey across the volatile American landscape that has been left in the wake of such a terrible campaign across the country. Hostiles opens in a striking and brutal fashion, grabbing your attention in an opening which is violent and devastating, more than setting the tone and establishing this late 19th-Century America as one of boiling point tension, with tragedy and death lurking around every corner. This sense of danger is more or less maintained throughout the odyssey that Captain Blocker and his crew embark upon to inconsistent effect. Rarely does it shock as much as it does in the opening scene and the sheer amount of danger that this group seems to come upon ends up feeling like ridiculous escalation rather than increasing dread. Cooper has adapted his script from a manuscript written by Missing screenwriter Donald E. Stewart, who died in 1999. That sense of long-gestating development can be felt as Cooper’s final script seems filled with tangents and characters who do undoubtedly have dramatic potential but are written out almost as soon as they have been introduced. The potential for a more balanced and nuanced approach to the conflict of Native Americans and the Frontier soldiers never quite feels as well-explored as it could have been. Both sides do have moments of reflection on their violent actions towards each other, and Ben Foster’s late character introduction does present an intriguing duality to Blocker’s own psyche, showing him the kind of man he could easily have become. But that amount of attention or complexity is not offered to chief Yellow Hawk and his family, with the film following a fairly cliched ‘misunderstood other’ approach without offering much in the way of fresh insight. As in all of Cooper’s films, he has once again assembled a cast of exceptional character actors. Rosamund Pike has never been better as a mother who experiences great tragedy, while the cast also features the likes of Timothee Chalamet, Jesse Plemons, Rory Cochrane and Adam Beach. The film does belong to Bale however, giving a performance of quiet intensity with a character wrestling with the actions of his past; actions that have supposedly been in the service for the good of his country. 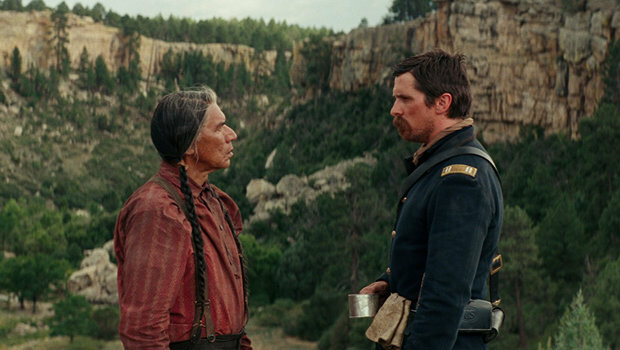 Hostiles is a handsome movie with a surging score by Max Richter, but it is all in service of a film which very much has the feeling of ‘been there, done that and enjoyed more the first time.’ It doesn’t offer anything too unique to the Western genre despite apparent fertile ground for a more intelligent and sophisticated depiction of the Frontier days. Overall, a disappointingly lacking ride out on the plains.